Posted Jun 14, 2018 by Eds. The Anthropocene poses certain aesthetic and cognitive problems of scale. To put it simply, we are the problem, but we can’t see it. In fact, even how we chose to define and conceptualize this “we” is part of the problem. (1) We have lots of models for thinking individuality, but very few for thinking “totality”—not just humanity as a whole, but also humanity in its interaction with non-human nature, what Marx called “external nature.”(2) The conceptual purchase of “the Anthropocene,” as a hypothetical name for a new geological epoch, is the suggestion contained within it—that we have entered a “new human” age in which we must understand our existence as a species not separated from nature but embedded within and coevolving with nature. (3) Coevolution, however, should not be taken to imply harmony and symbiosis: through our socially organized and mediated relationship with “external nature,” we are actively creating an increasingly hostile environment for human development and at the same time threatening the existence of thousands of other species. (4) But these are social-ecological challenges that are hard to see when we take an individualized point of view. How to tell this story from the perspective of the whole? This requires new—or at least refurbished—cognitive tools, narrative devices, and perhaps even aesthetic dimensions to grasp. It is to these challenges that John Bellamy Foster and Paul Burkett turn in Marx and the Earth: An Anticritique (2016). 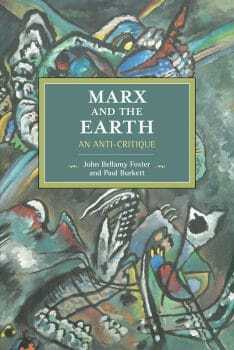 Both authors have made a name for themselves as proponents of ecological Marxism: Burkett in Marx and Nature (1999) and Foster in Marx’s Ecology (2000). 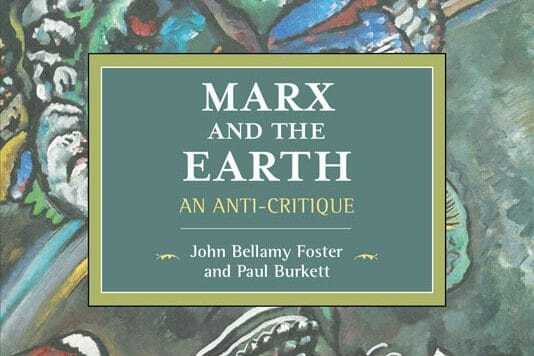 What distinguishes Burkett and Foster from other ecosocialists is their insistence that ecology is not something alien to Marx that then needs to be grafted on to his system in what an edited volume from the 1990s referred to as The Greening of Marxism. To clarify their position within these debates, they to put forward a theory of “stages” of ecosocialist thought. In the 70s and 80s, Marxists increasingly tarried with environmental issues; these however seemed to have no place in the Marxism they had learned (3). Many erstwhile-Marxists thus felt a need to modify, or even break with, Marxism in order to address the important environmental issues of their day. This break resulted in first-stage ecosocialism. However, as more Marxists assimilated environmental issues to their critique of capitalism, the more that they also began rediscovering in Marx’s writing an original ecological critique of capitalism. There thus emerged in the 90s a second-stage ecosocialism in which writers like Foster and Burkett sought to uncover what in fact had been hiding in plain sight all along—Marx’s ecology. “These second-stage investigations,” Foster and Burkett write, “led to the rediscovery of the ecological depths of classical Marxist thought and to the rejection within ecological Marxism of many of the presumptions of first-stage ecosocialism itself” (3-4). Foster and Burkett aver that we are now in the midst of a budding third-stage ecosocialism, in which the original insights of Marx and Engels have been rescued and are now being updated and applied to social and ecological contradictions of the twenty-first century. The reason the authors refer to their work as “an anti-critique” is to suggest that they are not simply defending classical Marxism from criticisms lobbied by first-stage ecosocialists and ecological economists (which they lump together for similar attitudes to Marxism), but that in the process of deflecting and disarming these critiques they are at once also deepening our and their own understanding of Marx’s ecology—anti-critique in other words is an active, rather than a purely reactive, process. The concept of anti-critique originates with Rosa Luxemburg’s pamphlet The Accumulation of Capital: An Anti-Critique (1915) (not to be confused with her major work which came first). However, the idea also has precedence in Engels’s famous discussion of Herr Eugen Dühring’s Revolution in Science (1878), popularly referred to as Anti-Dühring: “As Engels observed… he was ‘compelled to follow’ Dühring ‘wherever he went and to oppose my conceptions to his. In the process of carrying this out my negative criticism became positive; it was transformed into a more or less connected exposition of the dialectical method and of the communist world outlook represented by Marx and myself’” (Foster and Burkett viii). In a similar fashion, Foster and Burkett’s book chapters evolve largely as rebuttals to important and influential ecosocialists and ecological economists, in which they return to the primary texts of Marx and Engels to read what the authors actually said, rather than taking for granted clichés about classical Marxism, for example, that it is “promethean.” The end result, as in Anti-Dühring, is not a mere defense, but rather a full-blown exposition of ecological Marxism. Here, they are at pains to challenge the following presumptions about classical Marxism: (1) that it ignores nature’s intrinsic value; (2) that Marx was anti-ecological by referring to nature as “man’s inorganic body”; (3) that Marx and Engels, in rejecting both energeticism and the second law of thermodynamics (entropy), failed to factor energy into their theory of value; (4) that they adopted energy neutrality by not distinguishing renewable from non-renewable resources; and (5) that Marx’s value theory neglected “material flows” and ecological limits in his examination of capitalism’s reproductive cycles (7-8). Tackling the first, Foster and Burkett point out that Joel Kovel’s criticism that Marx neglected intrinsic value of nature confuses Marx’s critique of political economy with Marx’s own point of view. It is capitalism that neglects nature’s intrinsic value, focusing instead on exchange value. From the perspective of exchange-value nature presents capitalism with a treasure trove of “free gifts”—nature’s proverbial tap—which the capitalist eagerly expropriates without thinking about the environmental and social costs or consequences of such plundering. As Marx observes such “robbery” of nature’s wares often has negative consequences for the social metabolism that mediates a society’s relationship to nature, leading to rifts in the reproducibility (or what we would now call sustainability) of these exchanges between society and nature. (5) For Marx, socialism/communism seeks to overcome this “alienation of nature” that results from capitalist metrics of exchange-value, focusing instead on the sustainable generation of communal use-values. As Foster and Burkett observe, Marx’s interpretation of the labor process “leave[s] room for intrinsic valuation since it is part of use value broadly defined, and can be treated as a form of primary appropriative labour, including that of a mental and even spiritual type” (41). As Foster and Burkett repeatedly remind their reader, human society cannot separate itself from nature. Human existence depends on the species’ ability to use nature—that is, on appropriative labor. That the young Marx refers to nature as “man’s inorganic body,” however, does not imply that nature is simply there to be dominated. As the authors point out, Marx is using “organ” and “organic” in a more old-fashioned, Aristotelian sense, as referring to, or being related to, tools (65). Organs, in other words, are tools and nature is the “inorganic body” from which “man” draws “his” tools and, in so doing, develops “his” organic composition in a co-evolution with nature. (6) There is thus nothing inherently anti-ecological in calling nature “man’s inorganic body”; in fact, in many ways the expression points to an early sensitivity in Marx to the co-evolution of society and nature through appropriative labor: “For Marx, human beings are active, living, transformative creatures in charge of their own bodies and drives; at the same time, they are ‘natural, corporeal, sensuous, objective’ beings who suffer, whose natural objects, the conditions of their existence, the inorganic body of nature by which they seek to extend themselves, are to be found outside of themselves” (69).Thus, far from presupposing any kind of anthropocentrism, Marx’s conception of nature as “man’s inorganic body” instead sought to put human history in a dialectical and co-evolutionary relationship with nature (72-73). Capitalism, even if experienced as narrow and closed, is an “open system”; it exchanges material with other systems: coal comes from the ground (the Earth system) before it enters production (the social system) as a fossil-fuel throughput, but it then also leaves production as carbon-emitting smoke pollution entering back into the same biosphere that humans inhabit. The energy stored in fossil fuel has dissipated, i.e. become not useable, but with important consequences for the environment (one of them, ironically, being more heat/energy retention, which Podolinsky took as an “unalloyed good” ). In other words, there is constant dissipation of energy at the same time that there is accumulation. Part of the confusion for first-stage ecosocialists has been the misperception that Marx and Engels rejected the second law of thermodynamics, or entropy. This is a misunderstanding that undergirds the ecological economist Nicholas Geogrescu-Roegen’s otherwise enthusiastic appraisal of Marx and Engels’s theories. However, as Foster and Burkett carefully argue, what Marx and Engels rejected was not the second law of thermodynamics itself, but rather “its extrapolation into a theory of the heat death of the universe” and “the questionable cosmology that was being built on it” (172-73). As the authors show through a close reading of passages from Engels’s Dialectics of Nature (the key text in this debate), the heat death hypothesis was neither consistently scientific nor materialist: for the idea that the universe’s energy was finite and therefore could be depleted (i.e. consumed in cosmic heat death) led also to the non-scientific inference of a deistic “impulse from outside,” which had provided “original heat to the nebular ball” (Engels quoted. in Foster and Burkett 175-76). This was the Christian-eschatological view promoted the physicists Thomson and Tait. Engels, however, argued more cautiously that energy lost to earth was radiated back out into space where in fact it may be re-utilized, or converted, again. The universe, like the mode of production, is an open system in which conversion and dissipation operate simultaneously: “the death of one star, and one solar system (and indeed one ‘island universe’), could possibly become the basis for the formation and evolution of others under the force of gravitation. This theory [i.e. Engels’s] did not contradict the entropy law because it was conceptualized in open terms, that is, in relation to the interaction of solar systems and island universes (plural), not isolated systems” (Foster and Burkett 181). Readers familiar with both authors’ works will not be surprised at these conclusions nor, in fact, with many of the preceding chapters, which have been published before in slightly different versions. However, the sheer thoroughness of the book once these independent parts are brought together into one single anti-critique makes an even stronger and more compelling case for the ecological-materialist character of classical Marxism. One of the previously unpublished sections, however, may come as a surprise and will be of special interest to literary and cultural historians seeking a specifically Marxist mode of ecocriticism. Towards the end of their introduction Foster and Burkett argue, via Margret A. Rose’s reconstruction of Marx’s lost aesthetic theory, that Marx had specifically opposed the Hegelian idea that aesthetic beauty was the antithesis of natural beauty. For Hegel, natural beauty is appreciated via the senses, whereas “artistic beauty starts higher than nature” (quoted in Foster and Burkett 51). (10) Hegel noted that although “as a discipline…‘Aesthetic’ means “the science of sensation or feeling,” his Lectures on Aesthetics were “explicitly designed to contest this, and to remove the aesthetic from this sensory basis, separating it from external nature” (51). For Marx, on the other hand, “‘the emancipation of all human senses and qualities’, but also at the same time their active cultivation, through the education of the senses… was nothing other than the freeing up of human creative powers in history” (quoted in Foster and Burkett 54).An unalienated, emancipatory aesthetic would thus be one able to reconnect sensual experience, currently petrified in the airless realm of artificial beauty, with nature and humanity’s embeddedness in nature as a species whose entire culture and society is dependent on metabolic exchanges with nature. Here lies a whole research project outside the purview of what Foster and Burkett (through no fault of their own) are able to achieve in their book. But it is a suggestive thumbnail of where a Marxist ecocriticism may want to focus its attention and has an obvious applicability to a reassessment of Thomas Hardy’s novels of character and environment, Williams Morris proto-ecosocialist utopia News from Nowhere (1890), Bessie Head’s postcolonial-georgic When Rain Clouds Gather (1968), as well as Raymond Williams’s highly suggestive treatment of literature’s “structures of feeling.” A book that persuasively settles old scores at the same time that it opens new vistas in cross-disciplinary exchanges is one that warrants serious consideration. Marx and the Earth is that book. ↩For an overview of the debate about who is the “we” in the Anthropocene hypothesis, see Ian Angus, “Confusions and Misconceptions,” Facing the Anthropocene: Fossil Capitalism and the Crisis of the Earth System (New York: Monthly Review, 2016) 224-32. ↩Karl Marx, Capital: A Critique of Political Economy, Volume 1, trans. Ben Fowkes (London: Penguin 1976) 283. ↩John Bellamy Foster, Brett Clark, and Richard York. The Ecological Rift: Capitalism’s War on the Earth (New York: Monthly Review Press, 2010) 13-14. ↩Foster, Clark, and York, The Ecological Rift 14-15. ↩For a discussion of Marx’s metabolic rift theory, see John Bellamy Foster, “Marx’s Theory of Metabolic Rift: Classical Foundations of Environmental Sociology,” American Journal of Sociology 105.2 (1999): 366-405. ↩Implicit here, although not mentioned, is a clarification of why Marx refers to the aggregated fixed capital in the production process—factories and machines—as the “Organic Composition of Capital.” See Marx, Capital vol. 1, 762. ↩Marx and the Earth contains appendices with English translations of both this version of Podolinsky’s essay and the one published after Marx’s death as “Human Labour and the Unity of Forces” (1883). ↩On Marx’s disagreement with Ricardo, see David Harvey, “Marx’s Refusal of the Labour Theory of Value,” David harvey, 14 March 2018. ↩For their full critique of Tanuro’s charge that Marx and Engels were guilty of energy neutrality, see Foster and Burkett 15-33. ↩The quotation is from Georg Wilhelm Friedrich Hegel, Introductory Lectures on Aesthetics, trans. Bernard Bosanquet, ed. Michael Inwood (London: Penguin 1993) 4. However, Foster and Burkett have substituted “starts” for “stands” in the original quotation. I’ve preserved the substitution above in case it’s important to their intended meaning.